The Royal Crown Pomade comes from Memphis, the hometown of Elvis Presley and the heart of rockabilly. The product comes from the original pomade manufacturers J.Strickland and Co. That gorgeous head of rock ?n? roll hair will be styled in an instant with this classic pomade in its beautifully designed tin. And the pleasant nostalgic, masculine fragrance tops the whole experience off nicely.The Royal Crown Pomade was supposedly the favourite styling product of both Johnny Cash and Elvis. So who could doubt the quality? 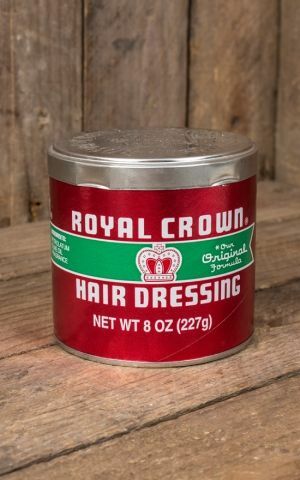 Since the 1950s, products from Royal Crown have been part of the essential kit for rockabilly fans and quiff lovers around the world. The Royal Crown Men?s Pomade and the Royal Crown Hair Dressing consist only of Vaseline, fragrance and olive oil. The latter has a particularly mild, sweet fragrance. If you want to look just like your rock ?n? roll idols then you?re on the right track with these styling products in hand. You?ll have the perfect quiff in seconds with a guaranteed sleek shine. Only those who need to tame the most stubborn of hair will need to look further than this pomade. And any rockabillies who have a couple of greys popping up can use the Royal Crown pomade stick ? the quick and easy way to get them covered.